The moon has two new craters in it today, courtesy of NASA and the LCROSS mission. Along with hundreds of thousands of other people, I got up before 4:00 this morning to watch the live coverage of the impact. It was … well, anticlimactic. But I’ll get to that below. It gave me an amazing sense of deja vu to see live coverage, from a NASA spacecraft, of the moon getting larger and larger. It’s been only 37 years since the last time … Welcome back, moon! Nice to see you again! Impact site is below and to the left of the prominent crater (center). NASA photo. Of course, this was very different from the Apollo missions. The difference was especially apparent when the second spacecraft (the “shepherding satellite”) hit the moon. There was no astronaut saying from the moon, “Tranquillity Base here. The Eagle has landed.” Instead, we got the flight controller saying from a control room in Mountain View, California, “Flight shepherding spacecraft impact, stations report LOS [loss of signal]. Last tracking at 11:35:35.054 seconds.” And then, that was it. From the operational point of view, the mission was over. The controllers got up, exchanged high fives, and started milling about the control room. If this had been a manned mission, or even a soft landing of a robotic mission, the work would be just beginning. It was weird for it to be over so abruptly. Just a few seconds earlier, there was an interesting comment from the science control room: “We confirm thermal signature of the crater over mid-IR camera.” For anyone wanting live, real-time science, this was it. As the chief scientist, Tony Colaprete, explained later in the press conference, the infrared camera saw a distinct bright spot, a little over a pixel wide, that was the hot, newly formed crater from the Centaur rocket impact. He was clearly jazzed about this detection, which they weren’t sure that they were going to be able to make. The ultraviolet spectrometers also got excellent readouts that should contain lots of information about the material that was thrown up by the impact. But Colaprete wouldn’t say, or even speculate, what they have seen yet. The main thing he wanted to emphasize was that the instruments worked and they got the data they wanted. The press conference was kind of interesting to watch because it was clear that the story the media found interesting was exactly the opposite of the spin that NASA would like to put on the landing. None of the four speakers mentioned this, but it was clearly written on one of the slides taken from an Earth-based telescope: No plume detected. Reporters are trained, of course, to look for the elephant in the room that nobody is talking about. They homed in on what Tony Colaprete, Jennifer Heldmann and Michael Wargo weren’t saying — the fact that none of the ground-based telescopes were reporting any visual evidence of the impact. I really think that the scientists should have acknowledged this up front. A lot of the publicity and a lot of the planning of the mission was built around the premise that the debris plume would be visible from Earth, certainly through the big professional telescopes in California and Hawaii, but even through a 10-12 inch amateur telescope. But it wasn’t. I think that the reporters were right to question the scientists on why no plume was seen (yet) and what this might mean. It is not clear yet that the plume wasn’t detected. Further image processing could reveal that it was there, but fainter than expected. “Gray on black,” as Wargo said. Even if the plume wasn’t detected, the crater was detected, and it was about the expected size. Its thermal signal will give a lot of information about what was at the impact site. Colaprete kept coming back over and over to the point that “spectra are where the science is at.” The spectrometers are more sensitive than the cameras, and they tell you what the chemicals are that you are looking at. For the most part the readout is not instant (although Colaprete did talk about a clear sodium line). Finally, Wargo reminded the reporters that this was an experiment. An experiment, by definition, is something whose result you don’t know in advance. You might have a prediction or a theory, but until you do the experiment you just aren’t sure what is going to happen. So the plume was smaller or darker or less dramatic than expected. That will still tell us something. So the press conference was an interesting clash of cultures. The media like pretty pictures, big explosions, and dramatic discoveries. They don’t like to wait. The scientists, as Jennifer Heldmann said, like “squiggly lines” (like the output of a spectrometer). They understand the value of patience and gathering all the evidence before you reach a conclusion. If you want to know whether LCROSS saw water ice on the moon, your best bet is to stay tuned. The answer is likely to come out at the American Geophysical Union (AGU) meeting in December, in San Francisco. I’ll be there! P.S. Maybe I was wrong about the media spin being different from the NASA spin. Here’s a mainstream media article that barely mentions the lack of a visible plume. The moment of truth has almost arrived for LCROSS. At 4:31 AM Pacific time, 7:31 AM Eastern time, the spacecraft is scheduled to slam into the moon at more than 2600 miles per hour, raising a plume of debris more than 6 miles up into the lunar sky. (I was about to write “into the air” there for a second, but of course that’s wrong because there is no air on the moon! In fact, the correct phrasing would be “into the lunar exosphere,” but then you might not know what I was talking about.) As I write this, LCROSS is about 42,000 miles and 17 hours of flight time away from its target. Of course, all the information that you could want is at the LCROSS website, including videos, animations, and information about where you can go to watch the impact. If you aren’t near an impact watching party and don’t have a 10-12 inch telescope, your best bet is to tune in to NASA-TV before 4:30 am Pacific time to watch the live coverage. On your computer, go to www.nasa.gov/ntv. The goal of the mission is not just to create a really big explosion on the moon. The “shepherding spacecraft” will fly through the plume created by the impact and will look for signs of water ice and hydroxyl ions — the same chemical signature of water that was detected in unexpected abundance by the Chandrayaan-1 mission. (See my last post.) Unlike any previous mission, this impact is expected to excavate a crater 3 meters deep, and so it will let scientists see if there is water ice below the surface, and if so how much. 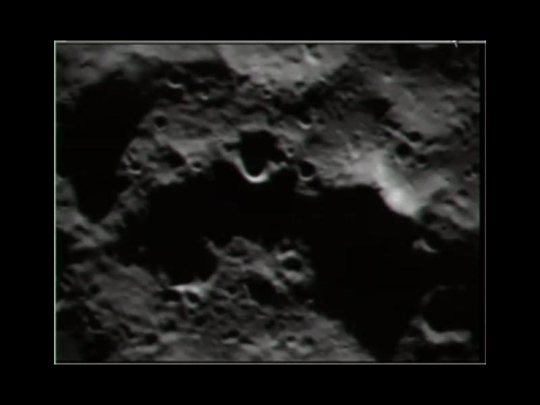 The impact site will be the crater Cabeus, near the lunar south pole. (This is a slight change from the announcement back in September – originally the target was a smaller crater called Cabeus A that is on the flank of Cabeus.) Here, from the LCROSS website, is a topographical map showing Cabeus and the expected impact sites. I think there are several cool things about this picture. 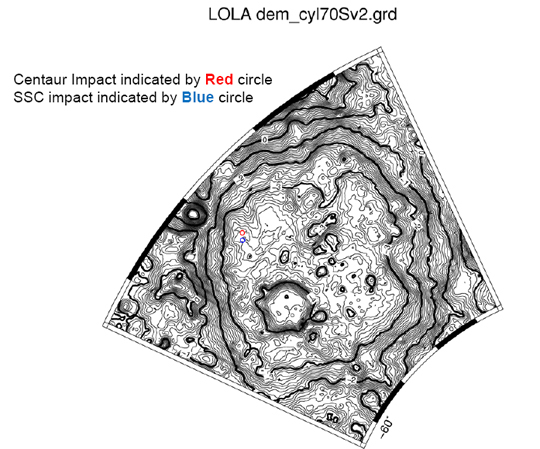 First, note the source: LOLA, the altimeter aboard the LRO mission. One of the great things about LCROSS is the synergy between it and the other moon missions that have flown to the moon recently. Without them, the project scientists would not have such detailed information about the place they are going to. Remember, it’s a crater that is in permanent shadow — you can’t see the bottom of it from Earth! The second thing that is impressive is the size of this crater. By comparison, the craters made by the Centaur and the shepherding satellite will be pretty puny! Note that there are two impacts scheduled. The Centaur is the rocket stage that boosted LCROSS into orbit. Instead of leaving the Centaur in Earth orbit, as they would normally do, the mission planners have taken it with them and they are using it as a projectile to create the dust plume. The shepherding satellite (SSC in the diagram) will fly through the plume and crash into the moon four minutes later. Those four minutes are the make-or-break time of the mission — that’s when the satellite will either detect water ice, or it won’t. Also, notice that the altimeter data tell us the depth of the crater. The heavy lines are intervals of one kilometer, and the impact sites are more than 3 kilometers below what we would call “sea level” on Earth. (On the moon we call it the “geoid,” where the surface of the moon would be if it were smooth.) Fortunately, as I said above, the impact plume should rise about 10 kilometers, so there will be no problem seeing it above the rim of the crater. So Earthbound telescopes will also be able to take pictures of the plume. But the shepherding spacecraft will definitely have the best view. Tomorrow will be an exciting day! Come back here tomorrow for pictures (I hope) and commentary from the post-impact news conference. Well, the news is out – and you read it here first! Carle Pieters, principal investigator for Chandrayaan-1′s Moon Mineralogy Mapper, published an article in Science that announces the discovery of much more water on the moon than anyone had suspected before. Previously, Lunar Prospector and other spacecraft had detected thermal neutrons that are indicative of hydrogen, concentrated at the poles. 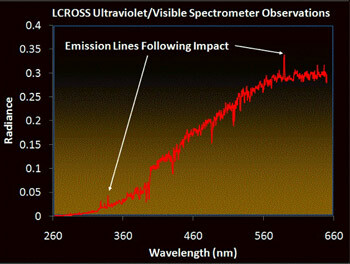 Chandrayaan-1 completed the picture by detecting an infrared absorption signal that either indicates the presence of water or a hydroxyl molecule — the (OH)- ion that couples with H+ to form water. Either way, you’ve got all the ingredients you need for water. There are many intriguing and exciting things about this discovery that call for followup. In a separate article, Jessica Sunshine of the Deep Impact mission reported an even more definitive observation that also show the concentration of water varying over the course of a lunar day! (N.B. A lunar day is 27 Earth days plus 7 hours.) Just like on earth, the “dew” is most concentrated during the lunar morning and then burns off. It then reaccumulates toward evening. Nobody knows where this water has come from or what the mechanism is for its appearing and disappearing. The conventional wisdom was that water couldn’t possibly exist on the lunar surface, let alone be refreshed on a daily basis. When people have suggested that water exists on the lunar surface, they have assumed that it had to be deposited there over the eons by comets and that it would only be found in “cold traps” — permanently shadowed craters near the poles where the temperatures are so cold that molecules of water cannot escape to space. Now it seems to be everywhere. But it is more concentrated near the poles, so the “cold trap” idea is not necessarily completely wrong. Before you get too excited, I should also say that the concentrations of water that the satellites found are extremely low: roughly a liter of water per ton of lunar soil. It remains a daunting prospect to extract such a tiny amount of water for human use. But still … as we said, maybe there is more at the poles, and maybe in really usable concentrations. This result in no way upstages the LCROSS experiment, which I’ve written about before. It sets the table for LCROSS. So far we have only looked from afar for signs of water ice, but LCROSS will take us right there and try to dig the ice up. Also, as I’ve said before, only LCROSS can tell us whether there is any water beneath the surface. Finally, it will be very interesting to see how this discovery affects the debate over where America’s manned space program should go next. The Augustine report, as you might remember, said that we need to increase NASA’s budget by $3 billion (from $18 to $21 billion) to get anywhere, and it highlighted two main options for what we can do with that money: “Moon First” or “Flexible Path.” I think the case for “Moon First” just got a whole lot better. However, the big political unknown is whether the case for either of them is strong enough to overcome the critics’ skepticism and get Congress to allocate the extra money. There may be water on the moon. There IS water on the moon! P.S. Some of the commenters on Richard Kerr’s article, which I linked to above, said that Science gave insufficient recognition to the Indian Space Research Organization (ISRO), which developed and launched the Chandrayaan-1 mission. They also resented the description of Chandrayaan-1 as a “defunct” satellite, although that is literally true. I think they have a point. Pieters’ article, of course, gives abundant credit to ISRO, because she was part of the mission team. However, the media coverage here has probably tended to downplay the fact that this was an Indian satellite. Some of the readers were congratulating NASA even though NASA had almost nothing to do with this mission. And though the satellite is defunct, it’s much more important to emphasize that the mission was a huge success. This was the mission that clinched the case for water on the moon. Period, end of sentence! I just got finished with watching, on NASA TV, a press conference at Ames Research Center to announce the target crater of the LCROSS mission. Before the selection was revealed, though, project manager Daniel Andrews announced some unexpected news. NASA has now dedicated the LCROSS mission to the memory of Walter Cronkite, the famous news anchor for CBS television who was for so many people the voice of the space program in the 1960s and early 1970s. A wonderful gesture! Cabeus A was especially attractive in terms of the last two criteria. The best evidence for water comes from the neutron spectrometer that flew on the Lunar Prospector mission (late 1990s) and the more accurate neutron spectrometer that is flying on the LRO mission right now. These instruments detect neutrons coming from the moon’s surface, and a dip in neutrons of a certain energy (“epithermal neutrons”) indicates the presence of hydrogen. Note that this method only detects hydrogen — it does not discriminate between water and other hydrogen-containing molecules! Conceivably we could be seeing methane or hydrocarbons. We won’t know until the LCROSS mission tells us. But in any case, Cabeus A has one of the best “sweet spots,” as Colaprete called it, where the concentration of water ice (assuming that is what it is) exceeds 2 percent. Also, Colaprete pointed out that Cabeus A offers excellent viewing. 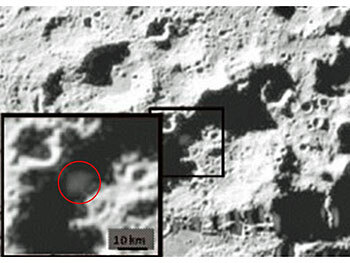 Because it is a little farther from the south pole than some of the other candidates, it is easier for Earth-based telescopes to see, and as proof he showed a photograph taken from the Apache Point observatory (one of the six large Earth-based observatories that will watch the impact), in which the crater shows up very clearly. Colaprete said that the impactor will be targeted to within 3 kilometers and probably quite a bit more accurately than that. One of the reporters asked when the results from the impact would be known. Colaprete said they will know almost immediately whether the experiment has been a success, in terms of the size of the debris plume and whether it has been seen successfully by the LCROSS spacecraft and ground telescopes. They will probably want to take a little time to determine whether they have seen water ice, and of course, it will depend on how much they see. He said they are required to report the results within 3 months of the impact, and he mentioned 30 days as a more likely time frame. One other interesting question concerned LCROSS’s fuel usage. At one point last month, when the spacecraft was out of the controllers’ view, there was what Andrews called an “anomaly in an avionics element.” Basically, the spacecraft was burning a lot of fuel when it wasn’t supposed to. When they realized what was happening, they were able to shut down the burn. But the result was that, instead of having a lot of extra fuel, the spacecraft now has just enough. “Fuel efficiency is now incredibly important,” said Andrews. Andrews explained that the fuel tank in LCROSS isn’t like the gas tank in your car, which has a float in it that tells you how much fuel you have left. 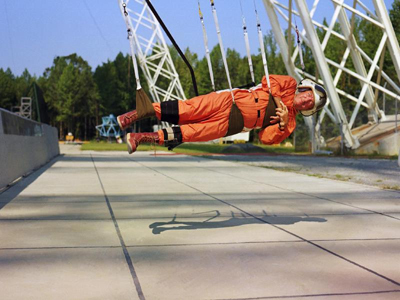 If you think about it, a float would not work very well in zero gravity! So there is a little uncertainty over how much fuel is left, but even in the worst-case scenario they are confident that they have enough to complete the mission successfully. You might think that an unscheduled fuel burn might have taken the spacecraft off course or made it start tumbling, but none of that happened. In fact, LCROSS is so perfectly on course that they have canceled three trajectory correction maneuvers, including one that was scheduled after the “anomaly” happened. Stay tuned, and get ready to point your telescopes at the Moon’s south pole at 4:30 am (Pacific time) on October 9! How could there be methane at the lunar South Pole? Well, it kind of depends on how ubiquitous it was in the early solar system. The permanently shadowed craters are good traps for any kind of volatile (i.e., easily vaporized) molecules, not just water. We’ve seen that there is lots and lots of methane on Saturn’s moon Titan — why not our own? Another interesting point that Colaprete brought out is the fact that we have no idea how much hydrogen/water/whatever is present below the surface. The neutron spectrometers only see hydrogen that is less than a meter from the surface. So we could in fact have huge concentrations of water ice farther down, and we wouldn’t know it. Hence, once again, the incredible importance of an impact mission, which will excavate material from a depth of several meters. Yesterday the U.S. Human Space Flight Plans Committee, also known as the Augustine Committee, released its report on the future of NASA’s human spaceflight program. Although I’ve read some criticism of their report online, I think the criticism is all of the “Shoot the messenger” variety. The committee did its job really well. The report sets out some basic and unpleasant truths that people have been averting their eyes from for a long time. It also laid out five reasonable scenarios for how NASA can move ahead. Even though this was not a decision-making committee, it did actually rule out a scenario that was unrealistic, which I thought was quite an accomplishment. The committee has provided in clear language the basis for the true decision-makers to make a decision. Now we’ll see if our leaders can step up to the plate — or, to use a more appropriate sports analogy since we have an ex-basketball player in the White House, we’ll see if they can sink the winning 3-pointer with the clock running out. Here are four options that the committee has said are feasible, plus the one that it said was not feasible at this time. (The report actually split option 3 into two sub-options.) Some of the names are theirs, and some are mine. 1) Moon Never, aka Napoleon’s Retreat. In this scenario, NASA continues with both its current budget and current objectives, which are incompatible. The shuttle is mothballed in 2011. The International Space Station is ditched into the Pacific Ocean in 2016. We continue spending money for a moon program that will never happen: “There are insufficient funds to develop the lunar lander and lunar surface systems until well into the 2030s, if ever,” the report says. This option is basically a full-fledged retreat from manned space exploration, with a fig leaf of ongoing research to cover our embarrassment. Don’t laugh. This is probably the most likely option. Napoleon didn’t want to retreat from Russia, but he did. 2) Moon Never, ISS on Life Support. Slightly more palatable, this option also abandons hope for sending humans beyond low Earth orbit, but it at least acknowledges that it would be a disgrace to build a space station for 25 years, operate it for 5 years, and then torpedo it. The Augustine committee said that we can keep the ISS going to 2020 by developing a smaller heavy-launch rocket and relying on commercial companies to generate cheaper alternatives for launching humans into orbit. A slightly larger fig leaf. 3) Moon First. The committee says that we can keep on track for returning to the moon in the mid-2020s (not 2020 any more) if NASA’s budget is increased by $3 billion per year, plus reasonable cost of living increases thereafter. “At this budget level, both the Moon First strategy and the Flexible Path strategies begin human exploration on a reasonable, though hardly aggressive, timetable. The Committee believes an exploration program that will be a source of pride for the nation requires resources at such a level,” the report says. Again there are various options based on how big a launch vehicle we want and how much help we can expect from commercial space services. 4) Flexible Path. This option includes lunar fly-bys, visits to Lagrange points (which are the gateways to low-energy transportation to many other places in the solar system), near-Earth objects (such as asteroids), and eventually Earth’s moon or the moons of Mars. The committee clearly likes this option because it is new and different from what has gone before, but it does not actually endorse the Flexible Path over Moon First. In light of the report, the U.S. government has two big decisions to make. The main one is: Do we want a manned space program or do we want a public relations agency? I think that if the question were posed to most Americans in that form, they would rather spend $21 billion for a bona fide human flight program with clearly stated and achievable objectives, rather than spend $18 billion for public relations and for plans on the drawing board that will never be achieved. To come up with those $3 billion, especially in these economic times and in this political climate, would be Obama’s version of hitting a 3-point shot at the buzzer. The subsidiary question, which is nevertheless important, is: After we have made our choice, what is our strategy? If we can’t afford a manned space program beyond low Earth orbit, we have to decide on which fig leaf to cover up our failure with. If we can scrape up $3 billion, do we opt for Moon First or the Flexible Path? The question is important because the choice will affect how and whether you can sell this option to the public. The Flexible Path would give Obama more of a chance to put his own stamp on the space program, rather than following in Bush’s footsteps. I would think that would be very attractive to him. However, as Paul Spudis argues in his blog, the benefit of Moon First is that you are building infrastructure. You don’t have to stake your case on inspiring the public, part of which has never been enthusiastic about the space program anyway. You can work on uninspiring but nevertheless achievable goals, with a long-term aim of making space economically relevant. If you are trying to extend human presence to a new realm, one-time sorties won’t do it; eventually you have to set up a base or a colony. The moon is the only place for that in the near future or even the medium future. As you can see, I think that Moon First is a little bit more sensible. But I completely acknowledge that I am biased because this is a moon blog. If the Flexible Path is the only way to sell a $3 billion increase to the American public, then I would be glad to support that instead. Finally, let’s talk about that $3 billion. How much of a burden is it, really? A look at the history of NASA’s budget on Wikipedia is really eye-opening. As a percentage of the Federal budget, NASA’s budget is lower than it has ever been since John F. Kennedy was elected president in 1960. We are talking the talk of doing great, ambitious things, but we are not walking the walk. If we miraculously find $3 billion more for NASA, that will raise its percentage of the Federal budget from 0.52 percent to 0.60 percent. Such extravagance! Such profligacy! Would this take us back to the days of Apollo? Hardly. It would take us all the way back to the days of 2008, the last time NASA represented 0.60 percent of the budget. By comparison, during the buildup to Apollo, NASA’s budget peaked at 5.5 percent of the Federal budget, or ten times as much as today. So, all things considered, I really don’t think that $3 billion is too much to ask. In fact, I hope that the experts will scrutinize the full report, when it is released, to make sure that we understand that $3 billion figure and make sure that it will really do the job. If so, Obama and Congress should sign off on it gladly, because they are getting a bargain.